Huge windows let the light flood into Stereo. There are leaflets and information everywhere, promoting their energetic programme of live music. This is one of Stereo's little secrets - there's a cosy little stage in the basement, making room for excellent gigs. Add to this a bar overflowing with just about every drink known to man, and we have a recipe for success. Near the beaten track but a true local secret, have a fun time visiting Stereo. If you're getting excited about your visit to Stereo, or if you're out on the town with a bunch of friends, maybe some dining nearby Stereo with some energy sounds right. Maybe you're visiting Stereo as part of a special celebration or anniversary. In this case, you'll need a restaurant to match your evening. Just as charming, but Italian, the garlic-laden thrills served by Amarone /Browse/Restaurant/Amarone(reveal best table deals?) are well worth a visit. 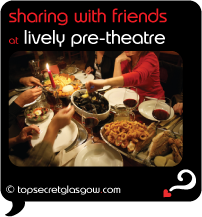 Hiding in a discreet basement spot, its easy to miss, although it sits just round the corner from bustling Buchanan Street. Warm and inviting, the authentic Italian cuisine served up in style here has locals in the know returning time and again. Feeling excited about your date with Stereo? What you need is a drink or two with your friends, and have a blast in the city. Brutti Ma Buoni (tel: +44 (0) 141 552 0001) in Brunswick Hotel offers the best drinks and food to the style-conscious crowds, most nights of the week. 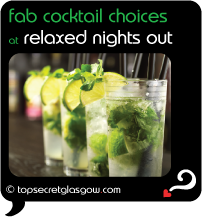 And the staff are some of the most friendly and laid back in the Merchant City. Add to this a pavement terrace, and we have a recipe for real success. Enjoy. From Stereo, a short stroll over to Buchanan Street will take you to a secret lane - home to Bar Soba /Browse/Restaurant/Bar_Soba__Kitchen(reveal best table deals?) . Those in the know dart along this lane, in search of some of the best cocktails around. The music keeps toes tapping well into the night, too. Projecting the polished, mirrored charms of a Parisian cafe, circa 1930, Vroni's never ceases to put a relaxed smile on every visitor's face. Stocking more cases of fizzy fun than we can shake an empty champagne flute at, the relaxed vibe here, complete with spluttering candles and creaking wooden floor, are impossible to beat. Enjoy. Glasgow has a reputation for warm welcoming people. And quality hotels can be found all over the city. A couple of crackers are close to Stereo. 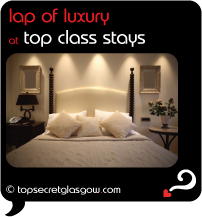 Finding the perfect place to stay over is a vital part of any trip to Glasgow. Abode /Browse/Restaurant/Abode_-_BarMC_and_Grill(reveal best table deals?) http://www.laterooms.com/en/p8275/hotel-reservations/87900_abode-glasgow-glasgow.aspx(reveal best room deals?) welcomes guests to top rated service, style and boutique town house delights in the city centre. The original grand building remains, and is combined with charming designer details throughout. Close to George Square and Queen Street Station, Carlton George Hotel /Browse/Restaurant/Carlton_George_Windows(reveal best table deals?) http://www.laterooms.com/en/p8275/hotel-reservations/146484_carlton-george-hotel-glasgow.aspx(reveal best room deals?) also offers lovely boutique townhouse living. Plus some of the best views over the city centre, from their Windows restaurant. A short walk from Stereo, this hotel is perfectly placed for exploring central Glasgow. Glasgow likes to think of itself as an extremely friendly city. Guess what? It is! Every visitor is made to feel welcome and at home, whatever their budget. Just round the corner from Stereo you'll find Rennie Mackintosh Station Hotel http://www.laterooms.com/en/p8275/hotel-reservations/152093_rennie-mackintosh-station-hotel-glasgow.aspx(reveal best room deals?) . 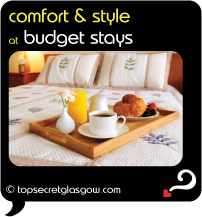 With special deals on bed and breakfast, and a warm welcome for comfy nights in the city centre, budget hotel stays in central Glasgow are made perfect here. Overlooking the tracks in and out of Central Station, Jurys Inn http://www.laterooms.com/en/p8275/hotel-reservations/73764_jurys-inn-glasgow-glasgow.aspx(reveal best room deals?) offers mid-range rooms at sensible prices. Warm and welcoming, this place puts guests in an excellent spot for exploring the city. And it really is nearby Stereo. How was your evening at Stereo? Hope you had a memorable time. Why not share? Let's talk... 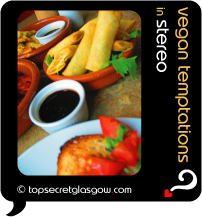 Pass us your cool Stereo memories here and we'll publish your very own Top Secret Glasgow pages on the web. Totally free, of course. 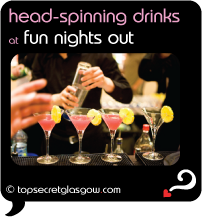 Then you can impress everyone with the fun times you're having in Glasgow. Great news! Finding this page means you can now join our VIP list for Stereo. Grab your very own web page all about Stereo. Do you have a special story about Stereo? A funny experience? A grand occasion? A funky photo? A personal tip? A top secret?